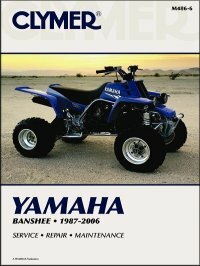 Yamaha ATV Repair Manual for your Banshee YFZ350, 1987-2006. Make sure that doesn't happen to you, your significant other, or the kids. Friends are sorta on their own, unless they have a Banshee, like you. Your Yamaha repair manual is cheap insurance against the dreaded Ride Day Demons, that show up unexpectedly. Not the Yamaha ATV service guide you need?